Seven staff members of IRRI's Social Sciences Division who had their birthdays in July started a different way of celebrating: share the joy with less fortunate kids through Project ShoeBox of the 4th Light Armor (Masigasig) Batallion of the Philippine Army. Project Shoebox is an outreach activity in which shoe boxes filled with school supplies and other goodies are solicited from donors and distributed to poor kids. The birthday celebrators requested their friends, colleagues, and AISAS (an IRRI employee group) for shoe boxes and collected more than 170 of these—more than three times their goal of 50 boxes. Beneficiaries of the activity were kids from select areas in the CALABARZON. 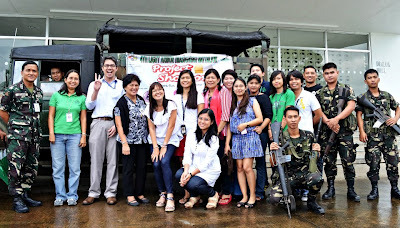 The shoe boxes were turned over to the batallion through a simple ceremony led by Lt. Col. Thomas Sedano and his staff, held on 3 August at the SSD lobby in Drilon Hall. Lt. Col. Sedano thanked the SSD staff and assured them that the shoe boxes will reach the schoolchildren of Masin Elementary School in Candelaria, Quezon Province. The birthday celebrators were Flor Palis, Dehner de Leon, Malu Malabayabas, Aileen Maunahan, Rodmyr Datoon, Gen Todcor, and R.G. Sarmiento.